Posted on October 28, 2017 by Karatzas Marine Advisors & Co. VESSEL DESCRIPTION & IDENTIFICATION: Launch Name was Atlantic Venus. Handysize Bulker, Call Sign 3FPN8, IMO Number 9628257. Built at Fukuoka SB, Panama Flagged, Length Overall of 179.90 m., Length Between Perpendiculars of 172.88 m., Draught of 10.12 m., Moulded Depth of 14.40 m., Beam of 28.20 m., Gross Tonnage of 21,440, Tonnage of 11,189 International Net and 33,145 Dwt (long). Design Fukuoka 33.5K by Fukuoka SB, Mitsubishi Engine, Speed of 16.50 kts, Heavy Fuel Oil, Horsepower of 10,140, Bunker Capacity of 1,684 IFO 380. VESSEL’S OWNERS & MANAGERS DETAILS: Osaka Shipping Co Ltd, Osaka, Japan. CARGO CAPACITY & CANDLING: 5 Holds, 5 Hatches, 4 Crane(s) (Centerline) with a safe working load of 30 tonnes (SWL), Grain Capacity of 43,520 cu.m., Bale Capacity of 42,700 cu.m..
MAIN ENGINE: 1 x Diesel – Mitsubishi 6UEC45LSE – 2-stroke 6-cyl. 450mm x1840mm bore/stroke 7,470mkW total at 130rpm. AUXILIARY: 3 x Aux. Diesel Gen – Yanmar 6EY18ALW – 4-stroke 6-cyl. 180mm x 280mm bore/stroke 2,400mkW total at 900rpm driving 3 x AC generator(s) at 60Hz, 1 x Emergency Diesel Gen. – Deutz TD914L06M – 4-stroke 6-cyl. 102mm x 125mm bore/stroke 99mkW total at 1,800rpm driving 1 x AC generator(s) at 60Hz. PROPULSOR: 1 x FP Propeller (Aft Centre) (mechanical), 130rpm. 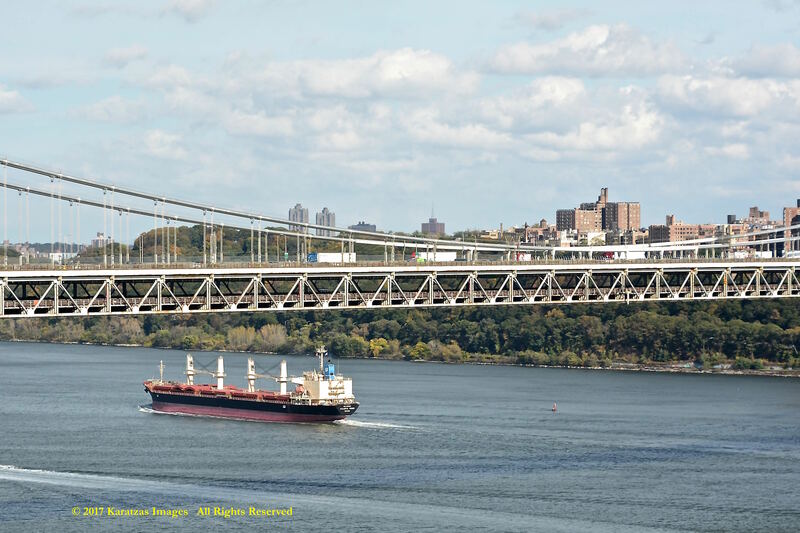 Well-equipped, modern-design handysize bulker (designed by and built at Fukuoka S.B., Japan) sailing upstream the Hudson River in New York. Seen here against the Manhattan skyline. Image credit: Karatzas Images. 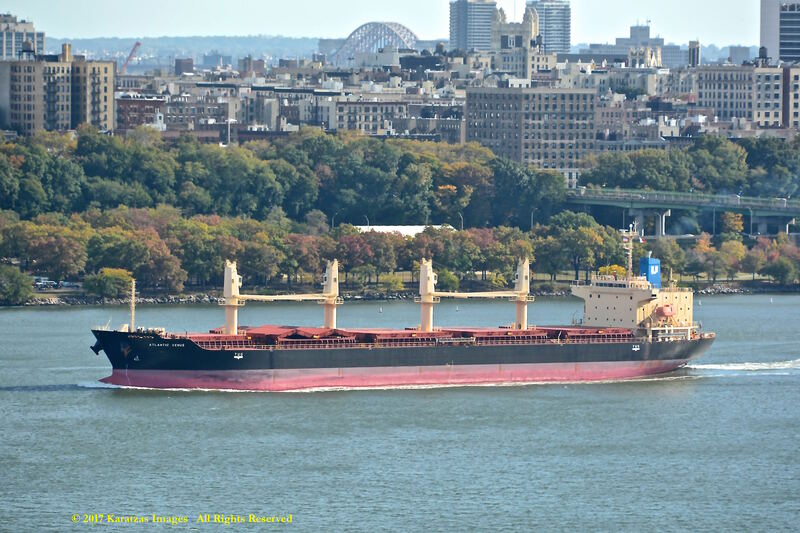 Well-equipped, modern-design handysize bulker (designed by and built at Fukuoka S.B., Japan) sailing upstream the Hudson River in New York. Image credit: Karatzas Images. 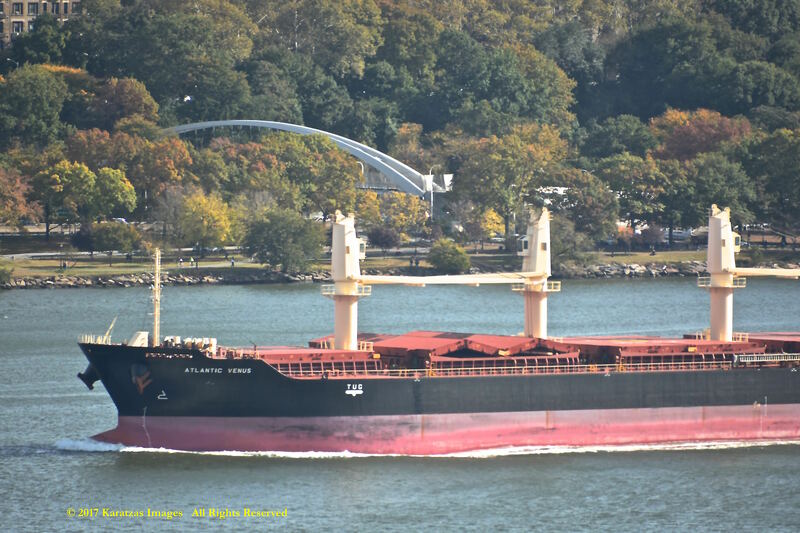 Well-equipped, modern-design handysize bulker (designed by and built at Fukuoka S.B., Japan) sailing upstream the Hudson River in New York. Detail of the bow and fore section. Image credit: Karatzas Images. 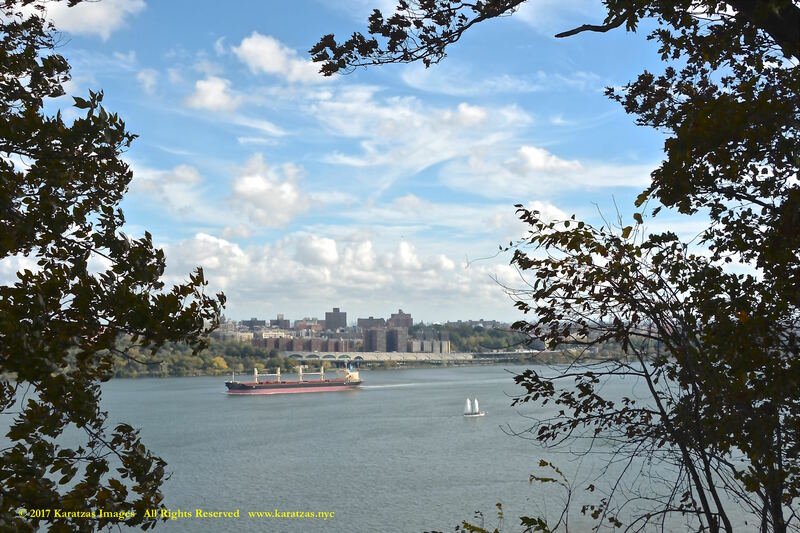 Well-equipped, modern-design handysize bulker (designed by and built at Fukuoka S.B., Japan) sailing upstream the Hudson River in New York. The ceiling, sorry the sky, painted by Michelangelo! Image credit: Karatzas Images. 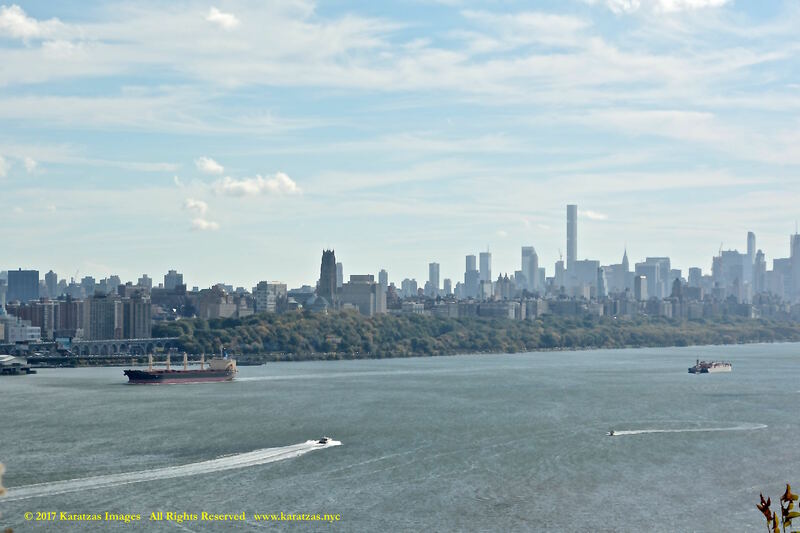 Well-equipped, modern-design handysize bulker (designed by and built at Fukuoka S.B., Japan) sailing upstream the Hudson River in New York. 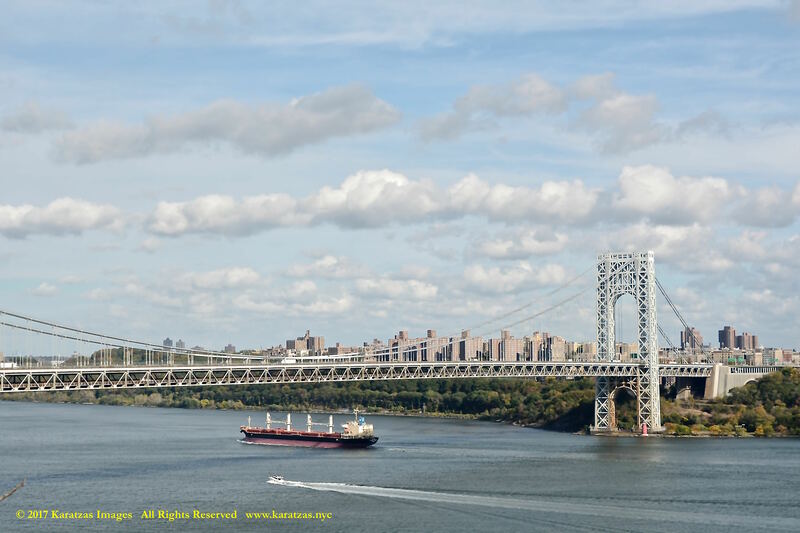 Approaching the George Washington Bridge; the sky looks like it’s painted by Michelangelo himself! New England autumn! Image credit: Karatzas Images. 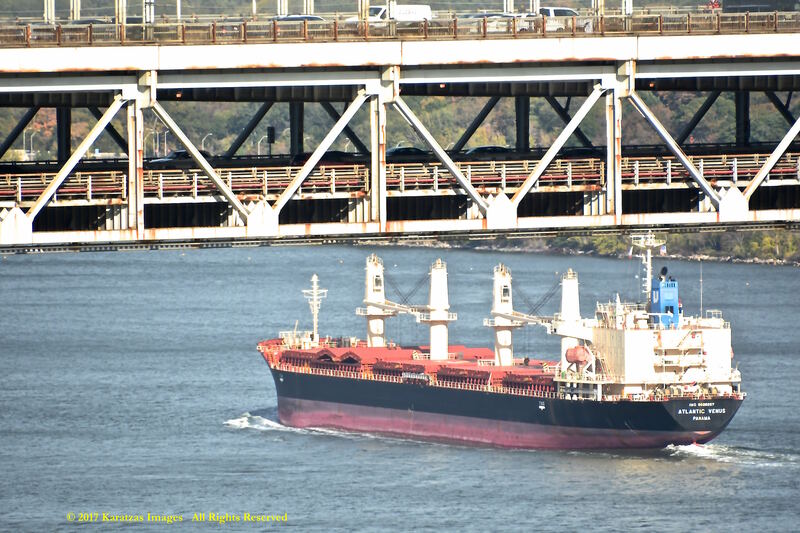 Well-equipped, modern-design handysize bulker (designed by and built at Fukuoka S.B., Japan) sailing upstream the Hudson River in New York. View of the stern, accommodation and superstructure; vessel high on the water. Image credit: Karatzas Images. 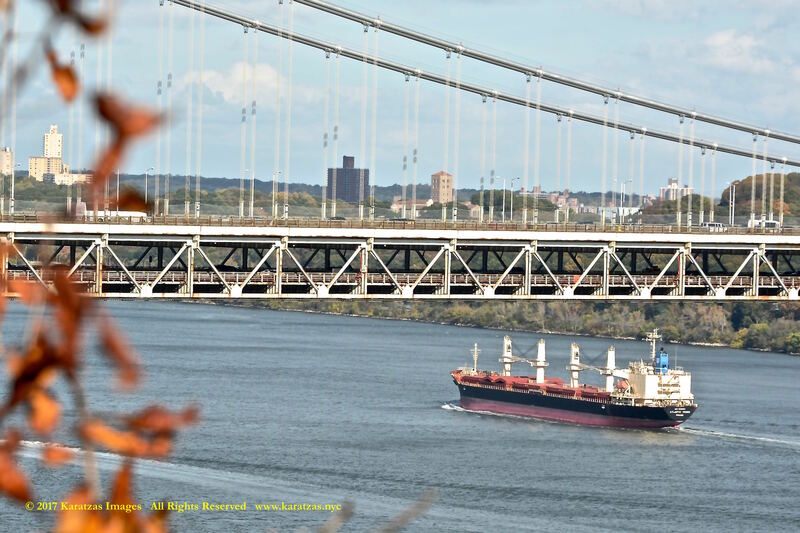 Well-equipped, modern-design handysize bulker (designed by and built at Fukuoka S.B., Japan) sailing upstream the Hudson River in New York; under the George Washington Bridge. Image credit: Karatzas Images. 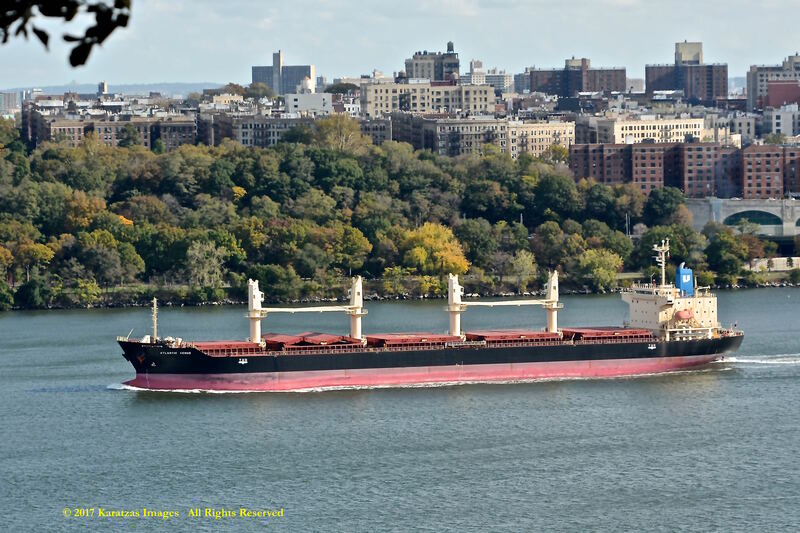 Well-equipped, modern-design handysize bulker (designed by and built at Fukuoka S.B., Japan) sailing upstream the Hudson River in New York. 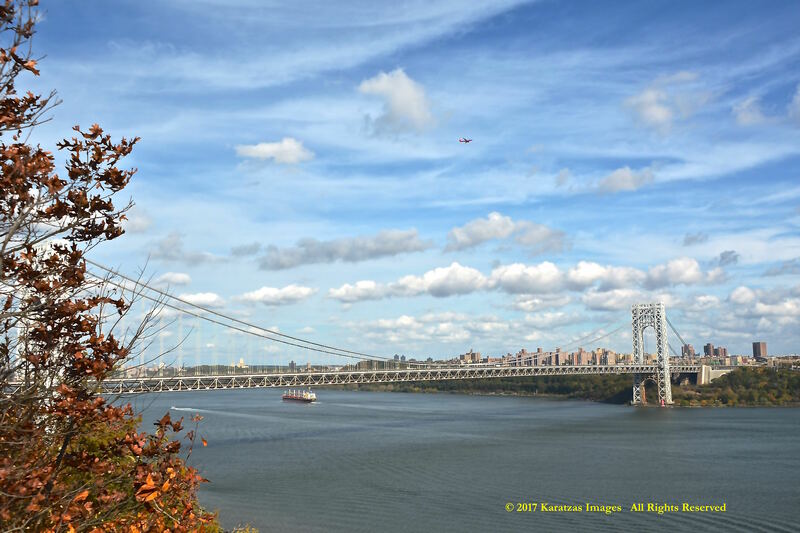 Under the George Washington Bridge; the sky looks like it’s painted by Michelangelo himself! New England autumn! Image credit: Karatzas Images. 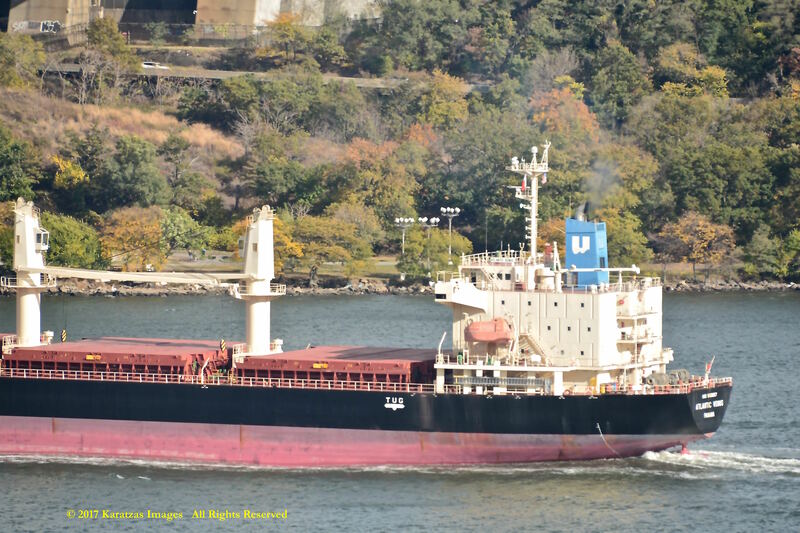 Well-equipped, modern-design handysize bulker (designed by and built at Fukuoka S.B., Japan) sailing upstream the Hudson River in New York. 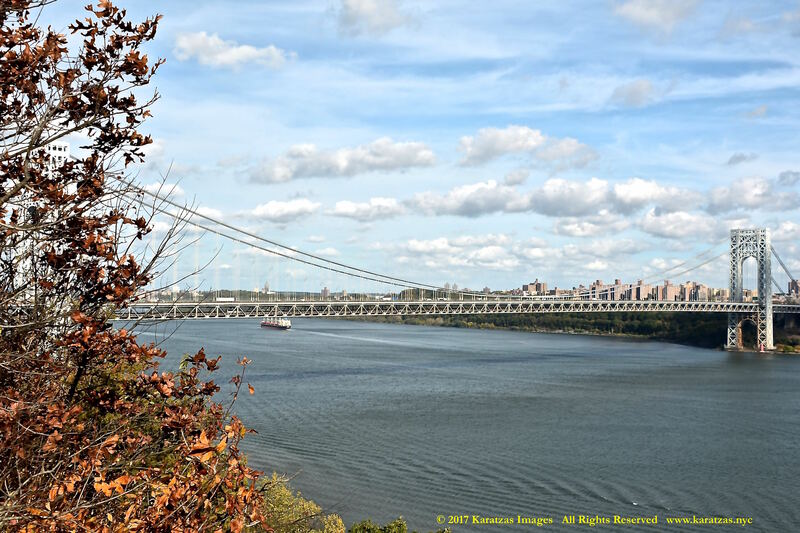 Beyond the George Washington Bridge; the sky looks like it’s painted by Michelangelo himself! New England autumn! Image credit: Karatzas Images. 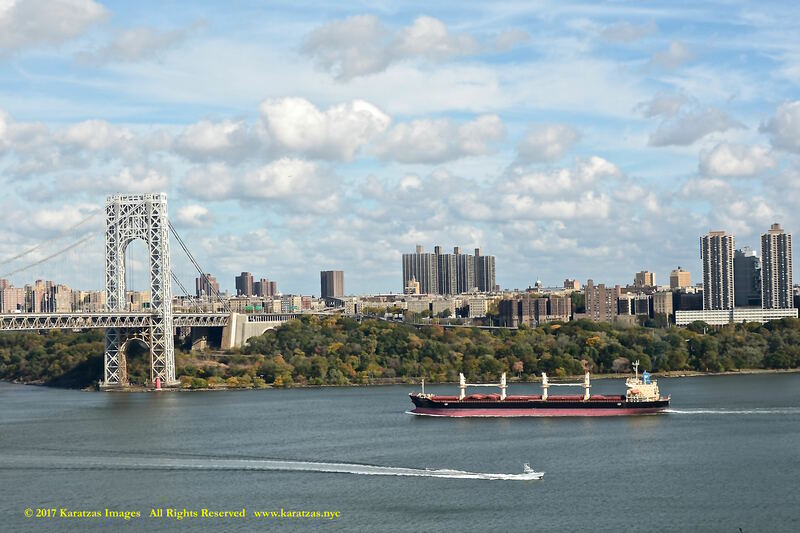 This entry was posted in Dry Bulk Vessel, Port of New York and tagged autumn, foliage, Fukuoka S.B., George Washington Bridge, handysize bulker, Hudson River, Karatzas Images, Karatzas Maritime Images, Manhattan skyine, Osaka Shipping, Osaka Shipping Co Ltd by Karatzas Marine Advisors & Co.. Bookmark the permalink.